We are now offering used 55 gallon barrels for sale with delivery to your place of business. Product used in all barrels we offer was non-hazmat material. 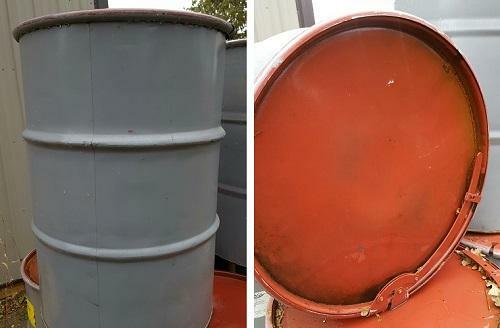 We currently have a growing supply of slightly used clean 55 gallon steel drums. It is our intent to provide an ongoing supply of these drums to our customers. Available in minimum quantity of 4 pending location, shipping options and other requirements. We typically deliver used 55 gallon drums in quantities of 8 stacked on 48 x 48 pallets. Quantities of a few pallets to a full dock truck or full semi trailer load can typically be arranged. Deliveries can be arranged within our current service area or beyond dependent on availability and your specific needs. Contact us for more information including availability and pricing. The 55 gallon gray drums have a red lever lock lid. The lever action lids are very easy and quick to use. These drums were previously used for stainless steel shot (non-hazmat material). 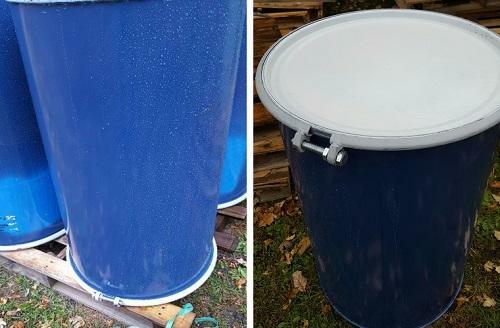 The used 55 gallon blue drums are made of steel and include a Bolt top. The white top includes a rubber seal gasket. Material previously contained in these drums included a non-hazardous adhesive in a liner. These drums are in like new condition.